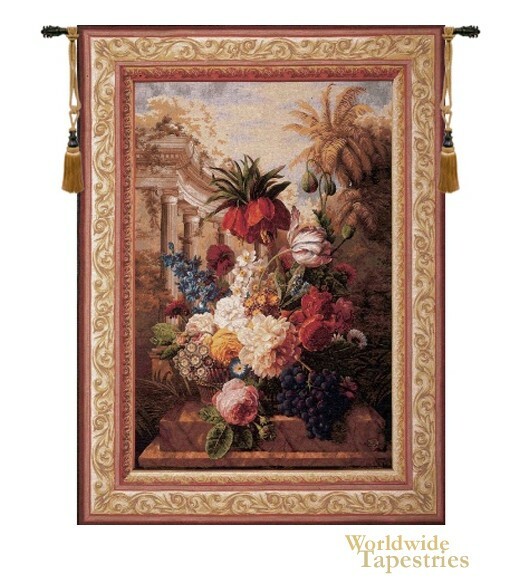 Bouquet Exotique II tapestry is based on a work by Flemish artist Jan Frans Van Dael from the 18th century. This paradise floral tapestry full of exotic flowers, shows blooms and grapes on a ledge, set in a garden with ancient columns and palm trees. This piece shows gorgeous color which highlights its main subject well against the background. Van Dael (1764-1840), born in Antwerp, produced painting of flowers and fruit, in the style of the master Dutch painters such as Van Huysum. The original is now in Rouen, Normandy. This floral Belgian tapestry "Bouquet Exotique II" is backed with a lining and has a rod pocket for easy hanging. Note: tapestry rod and tassels, where pictured, are not included in the price.